When State Representative Julio Robaina sponsored HOUSE BILL 1223 in 2004, we were all looking forward to a CONDO OMBUDSMAN’S OFFICE that would help Florida’s condo owners with great educational information and well-trained Election Monitors making sure that disputed elections are done according to the Florida Administrative Code. It started out real well – with owners very happy with the services provided by Condo Ombudsman Virgil Rizzo. But obviously too well for the taste of Donna Berger (at that time with the law-firm of Becker & Poliakoff), because she filed some in the eyes of many folks “dubious” complaints against Rizzo, accusing him of all kinds of wrongdoings. Governor Jeb Bush fired Rizzo unceremoniously without even giving him the chance to listen to his side of the story. But that’s Tallahassee: Money and power rules – and the interest of the citizens are often plainly ignored. From the moment of Rizzo being fired the whole idea of a helpful Condo Ombudsman’s office went down the drain and has reached today a point of no return. At this point we have – in my opinion – with Bruce Campbell a Condo Ombudsman who took the position to earn a second pension, not to do the work necessary to do what House Bill 1223 had intended. It gets even worse when talking about the second in command, a guy named Richard Luther, running the Ft. Lauderdale office. 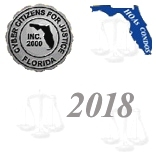 In recent times we received many complaints about the conduct of the Ft. Lauderdale office of the Condo Ombudsman, especially the election monitors assigned by this office. If the list of names supplied by the Division and the SUPREME COURT OF OHIO are correct, Richard Luther is an “indefinitely” disbarred attorney who made his way to Florida after losing his law license (See: Case No. 2012-0305) in Ohio. For me it’s a pretty far way from divorce attorney in Ohio to Condo Law specialist in Florida. That may explain quite a few of the problems owners dealing with the Condo Ombudsman’s office in Ft. Lauderdale are experiencing. Especially the complaints about assigned election monitors are piling up in recent times. We hear a lot of new names – the experienced election monitors doing the job since many years seem to have fallen out of favor. But the new ones clearly lack the knowledge and experience and – according to owners’ complaints -- are allowing the association attorney to take part in the election and counting process. If the owners signing the petition requesting an election monitor would trust the association attorney they wouldn’t ask for an election monitor – wouldn’t you think? And it is outright ridiculous if a former Becker&Poliakoff employee is assigned as election monitor to a condo association election where the law firm of Becker&Poliakoff represents the association and their attorney is present at the election. That kind of assignment leaves more than a bad taste, it’s an automatic path to DISTRUST. Why isn’t it possible to find good honest employees willing to do the job condo owners are paying them for?